It is an odd place Central Park. Stuck right in the middle of Manhattan, it is vibrant and glorious during the day, but at night it takes on a whole new magic ……. So I find myself on the West Side of New York City, it is 11.30 pm and I have 3 choices, get a cab to the East Side (it feels like getting automotively mugged), walk south down Central Park West, cross through Columbus Circle, carry straight on towards the East River and then back up again (exhausting) or take a stroll through the park. So stroll it was. Entering at 72nd Street, past the unimaginative ‘Imagine’ mosaic tribute to John Lennon in Strawberry Fields (he deserved better to be honest), down the steep incline (like a blindfolded drunk in a coal mine) and on to Bethesda Terrace. Once you get over the eerie silence, pierced only occasionally by some nocturnal creature declaring its need to procreate and the eye watering darkness (they really must invest in brighter street lighting here) it is not so bad. 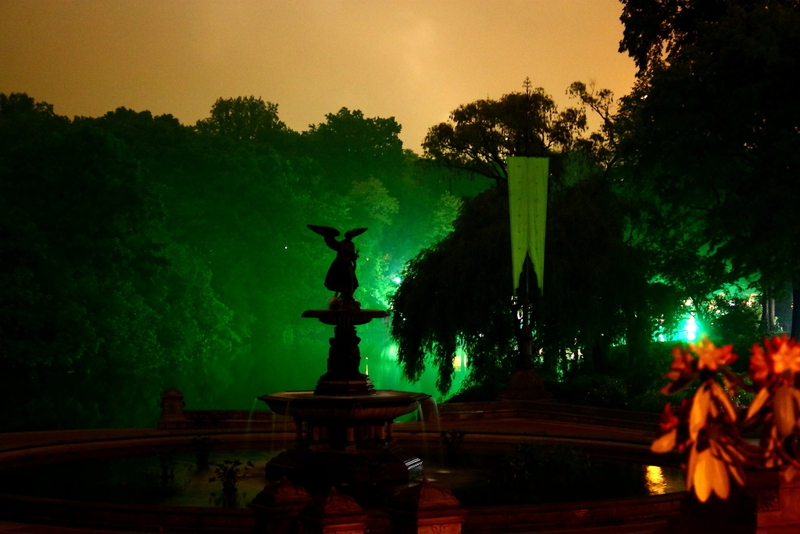 I take my camera absolutely everywhere I go, so, Ladies and Gentlemen, the magnificent Bethesda Terrace by night. 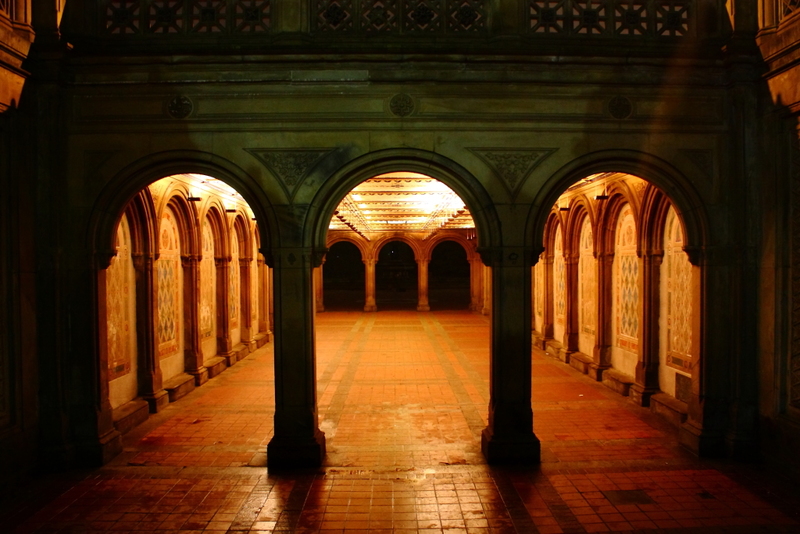 Under The Bethesda Terrace, looking toward the fountain. This is amazing. Somehow, it looks like what New York is really all about, beautiful, moody, mysterious. Fantastic work! Great stuff. You are really talented. Great work. Thanks for the re-blog and your encouraging comment. Appreciate your support. hey np I love your work. Got to know you through Gsquared.Beautiful Blog. Thanks for your comment and thank you Gsquared. Some extremely evocative photos. I can see I’ll have to spend a lot of time exploring your blog! Fantastic photos and commentary. I have a new perspective on the Park. As a visitor to New York, Ive only ever seen it during the day. Thanks. 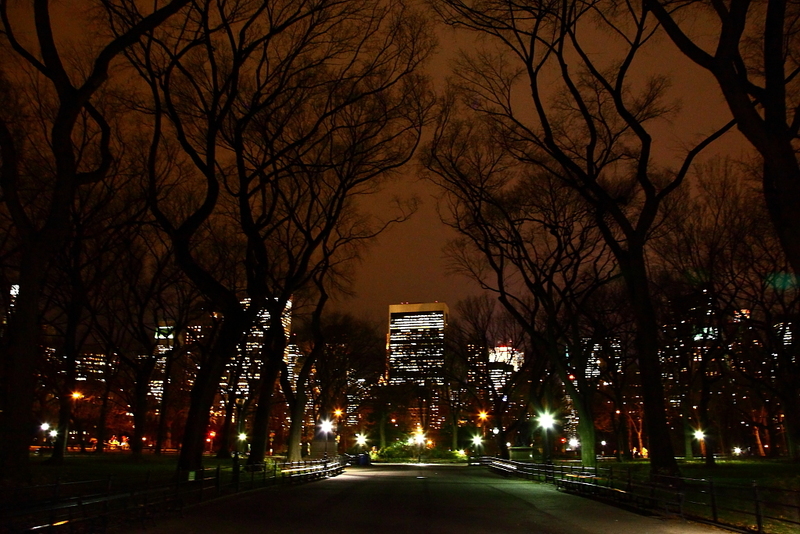 I wouldn’t advise anyone to walk around Central Park at night. Not so bad below 90th Street, but the Northern end of it is definitely a ‘no go’ after dark. Thank you for your kind comments. Beautiful photos that bring back memories of walking through those places in my youth. I am so pleased I can bring back an emotion for you, that is what it is all about. Thank you for that. i’ll be traveling to new york next year. i look forward to seeing places you’ve photographed. i love these photos. wonderful! Thank you, if you need any advice on where to go and get a true glimpse of the dark underbelly of New York I would be more than happy to help. thank you so much! i might just take you up on it! btw, do you have any experience with lightroom? i have photoshop but thinking of getting lightroom. what’s your take on it if you don’t mind. I don’t mind at all, but sorry, I can’t tell you anything about Lightroom or compare it with Photoshop as I don’t use either. I generally rely on my camera settings and the DPP software that came with my Canon. I always shoot in RAW and then play with the contrast, brightness, sharpness etc to get the desired image. When I do feel the need to change more than that (creating the B/W background in ‘Tango in Union Square’ for example) I use Coral Paintshop Pro. Cheap and cheerfully simple, that’s me. thank you anton! your work is brilliant! They are indeed magnificent images, Anton. I enjoy your prose, also. Thanks so much for liking one of my posts. It means a lot! How wonderful it must be to be a photographer living in one of the most exciting, most inspiring cities in the world. Looks like you made the right choice on the walk – no one likes getting automotively mugged plus you got some great shots for your effort! Incredible photos – love the mysterious feel – thanks for sharing! Thank you, I am so pleased that you like them. Kirsten, capturing is a splendid thing. You are too kind. Please feel free to explore. I hope I can keep you interested. Thank you. You know, Central Park is not quite as bad as its reputation. Having said that, there is a 1am curfew for a reason. I am about to embark on a journey that captures the real New York City at night. I hope you enjoy it. Missed this when you first pressed it. Absolutely love this! Thank you, I do too. It has an ethereal quality about it I think. I agree. Such a delicate contrast to the grittiness of your other pieces. It’s great to see both sides.